Ever thought about making your local small park or little patch of green a better place to be? Council's Shared Gardening program is all about helping you make these things happen! 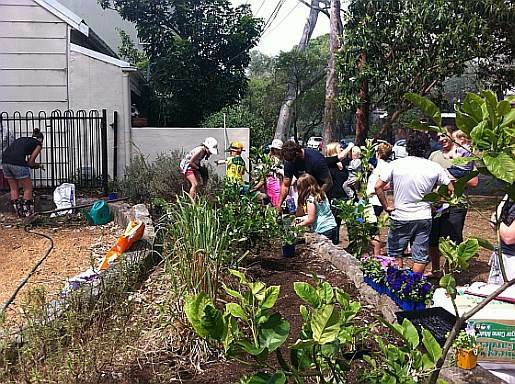 Shared Garden groups can be formed in a small area of a park, on your street verge or on a nature strip. If you would like to see some changes in your local small park and you are interested in gardening, then this program could be for you. Resident volunteers have been in action at many small reserves around Waverley. Some including O'Donnell Street Reserve, North Bondi and St James Road Reserve, Bondi Junction having been established since 2007. St James Road Reserve are actively planting, watering and weeding along with growing vegies in their park. Through their gardening group they've built a great sense of community - with each other and also with passers-by. For more information call 9083 7925 to see how you can create a Council supported Shared Gardening Group for your little patch of green. With your help we can enliven your little patch of green creating a more attractive, productive space, transforming it into somewhere special to spend time connecting with your neighbours .